Technology has changed reading in many ways, and one of them is that it’s rarer now to read a book in ignorance; we frequently come to books having read, or at least glimpsed from the corner of our eyes, dozens of Amazon or Goodreads reviews, seen breathless recommendations from Twitter users, or even watched the trailer. And so New Amsterdam by Elizabeth Bear (Subterranean Press, ebook, 4797ll), which I bought in epub from the Weightless bookstore on the basis of its wonderful cover by Patrick Arrasmith, was able to give me a pleasure I had long-forgotten: beginning to read a book, and slowly realising it’s in the same series as another book I liked a lot! It took me back to reading The Last Battle as a child, and part-way in thinking, Hang on, wasn’t this Aslan guy in that cartoon I saw at Christmas? It was in The White City (reviewed in #42) that I had first met the main characters in New Amsterdam: Sebastien de Ullua, a thousand-year-old (at least) vampire and his friend, lover and blood bank Jack; and Abigail Irene Garrett. This precedes The White City. It’s in these pages that Abigail meets Sebastien for the first time, once he and Jack reach the city of the title and get themselves into trouble. At this point she is still a Detective Crown Investigator, and by the end we have discovered the circumstances in which she left that position. The book can be read as a novel, and themes and storylines stretch across the length of it. It reads more naturally, though, as a series of novellas and long short stories – some saw separate publication in magazines. The first is “Lucifugous”, in March 1899, a murder mystery upon a zeppelin – a tricky way for a vampire to travel. “Wax” sees Garrett investigate the death of a boy whose skull has been cracked and his brains scooped out. In “Wane”, set in 1902, they investigate the murder of the Lord Mayor’s wife, and meet Michel Nezahualcoyotl, an ambassador from the Aztec Emperor. In “Limerent”, set later that year, the victim dies in a locked room, an unfired gun in his lap. A very old acquaintance of Sebastien makes an unwelcome return in “Chatoyant”, and their subsequent flight from New Amsterdam takes them to Paris. In “Lumere” they meet the old ghosts of that city. A thread running through the book is the slow build of tensions between the colonies and the King, and the part played in that by the French and the Irish, with whom Jack has some sympathy. The relationship between Jack and Sebastien, who doesn’t care much for the games of what are to him ephemeral nations, is sensitively depicted, a May to December romance to beat them all. We never doubt what each of them gains from the other, and can understand why they stick together despite the faultlines in their relationship. The same goes for Abby Irene; Sebastien is gorgeous, of course, but he fascinates her, a bottomless well into which she can pour her boundless curiosity – when the cases allow. Supernatural mysteries seem to be very much in fashion at the moment, and here is an older book in which both elements are superbly handled, the solutions to the murder mysteries clever, the supernatural elements truly frightening. The romances are convincing, affecting even my cold rock of a heart, the politics and schemes and world situation an interesting variation on events in our history (it’s New Amsterdam, not New York). Books structured this way always appeal to me – the legacy of growing up on sf fix-ups. An excellent book, and I wish I’d read it sooner. When last we left him, Chesney Arnstruther had set himself up as a superhero – The Actionary – found himself a nice girlfriend, Melda McCann, and caused significant problems for the bad guys, up to and including Lucifer himself. It was trouble twixt heaven and hell that got him his super-powers in the first place, a by-product of a negotiation between the two post-mortem destinations. That all happened in The Damned Busters, book one in the To Hell and Back series, reviewed in #37. Costume Not Included (Angry Robot, ebook, 4432ll) is book two, and it continues from the first book pretty much directly. Chesney’s “weasel-headed, sabertooth-fanged” demon Xaphan is now much friendlier, having grown accustomed to the benefits that come with working for the Actuary. Chesney’s over-protective mother Letitia has taken up with the Reverend Billy Lee Hardacre, a top-rated television preacher who plans to announce The Actionary as the prophet of a new era. Crime rates are low, thanks to the city’s new superhero, and so Chesney ends up investigating a cold case, the disappearance of a journalism student nine years ago, which quickly blows hot. 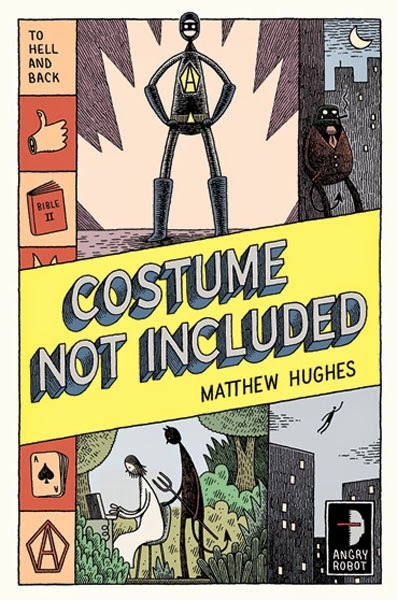 As with the superheroics of the first book, the most entertaining element of Costume Not Included might be considered a spoiler, were it not shown in Tom Gauld’s excellent cover illustration. Yes, that’s Jesus typing on a laptop at the bottom (or at least one version of him), brought into the story by Chesney to write a new Bible. Hardacre thinks the universe is a book being written by God, and maybe he’s right – trouble is, this Jesus comes from an earlier draft. It’s amusing to see how the conversation between Jesus and a modern-day television evangelist might go. If you’re a fan of the TV show Community, imagine how Abed might cope with almost infinite power in a world of angels and demons and you’ll have a good sense of this book. If the Actionary dangled me over the edge of a tall building, I’d say whatever he wanted me to say. If he created a safe environment for me to express my feelings honestly, I’d admit I prefer this writer’s far future science fantasy to these modern day superheroics, but I enjoyed this book more than the first, perhaps because all the pieces of the world were in place and the author could just start playing with them. 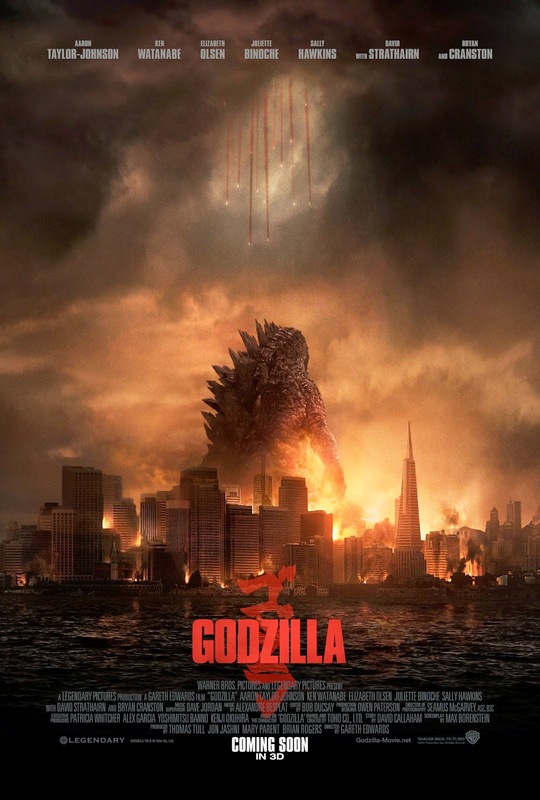 By my count the new Godzilla, directed by Gareth Edwards, is the twenty-third I’ve seen, the first being King Kong vs Godzilla on Saturday morning television as a child, the most recent Godzilla, Mothra, King Ghidorah: Giant Monsters All-Out Attack, a week before this new American production came out. This is the first appearance of the monster since Godzilla: Final Wars, which underperformed at the Japanese box office but did give us the pleasure of seeing baby Godzilla ride in a truck and Roland Emmerich’s female Godzilla fighting her Japanese inspiration. (It wasn’t a long fight.) For the uninitiated: there are three runs of Japanese Godzilla films: the original Shōwa series, from Godzilla in 1954 to Terror of Mechagodzilla in 1975, the rebooted Heisei series, from Godzilla 1984 through to Godzilla vs Destroyah in 1995, and lastly, after the America Godzilla of 1998 failed to produce any sequels, the Millennium series of standalone films, from Godzilla 2000 in 1999 through to Godzilla: Final Wars in 2004. Most Godzilla films are entertaining (even the really bad ones, like Godzilla vs Hedorah), though the lack of variety does make you wonder why quite so many of them were made. Happily, this is not another remake of the original film, nor is it yet another direct sequel. Here, the world at large is not yet aware of Godzilla’s existence. Although he was sighted at sea in 1954, and attempts were made to destroy him, he hasn’t previously come ashore. Rather like Transformers: Dark of the Moon and its explanation of the moon landings, Godzilla winds into itself real world events like the nuclear testing in the South Pacific, and disasters like the 2004 tsunami, the Fukushima meltdown, September 11 and the New Orleans floods are echoed throughout. Godzilla is once again a force of nature, though that hasn’t always been the case in the past. In All-Out Attack he was supernatural, resurrected to attack Japan by the ghosts of those killed in World War II, while in other films he is a reluctant defender of the Earth against alien aggressors, or himself the servant of such aliens – he can be anything a film requires. Here he represents the power of natural forces, capable of utter destruction, yet also grace and beauty. This is his planet, really; we’re the ants scurrying on its surface. Godzilla is as powerful in this film as I’ve ever seen him. He has mass and strength and for once you don’t have to imagine what he is like, you can see it on the screen. To take a monster represented by a man in a suit and turn that into a believable living creature, with it still being recognisably the same creature, is quite an achievement. The colossal creatures he fights are terrifyingly alien (think of that huge strange beast from the end of The Mist). The size and strangeness of them all is reinforced by our point of view being restricted, for most of the film, to that of the humans experiencing these events, some battles seen only through snatches of handheld camera footage on television, This is a world where humans are no longer the protagonists. We’re part of the scenery, desperately trying to avoid being chewed. Godzilla is the star, and that’s reflected in the cast, made up of respected actors – Bryan Cranston, Juliette Binoche, Aaron Taylor-Johnson, Elizabeth Olsen, Ken Watanabe, Sally Hawkins – rather than the kind of movie stars who automatically make for big opening weekends. It’s a risk that pays off. They aren’t superheroes, they’re regular people doing their best to help others and protect their families and survive in appallingly dangerous circumstances. We spend most of the film with the military, watching their almost futile attempts to guide the creatures away from population centres, but the action begins cleverly with the workers at a nuclear plant. We’ve frequently seen these places destroyed by Godzilla and his fellow monsters, but to be inside the plant while such an attack is happening brings home the effect that these events have on ordinary people. It’s not as if that human perspective was never represented in other Godzilla films, but it’s the primary focus here. The music reminded me in places of the Japanese scores, and that much of the story took place in Japan felt respectful to the character’s origins. We often see Godzilla serenely swimming in the ocean, which seemed to reference scenes in Godzilla vs Mothra (1992), one of my favourite films in the series (and of all the Godzilla films I’ve seen, that’s the one this most resembles). It’s rather a dark film for much of the time, so I wish I’d watched it in 2D without the darkening effect of 3D glasses – and I would have preferred to have seen the final monster battle in daylight. But that’s the worst I can find to say about it: for me this is the best Godzilla film since the Heisei era, and it’s much better than the inferior films in the Shōwa series that followed 1968's excellent Destroy All Monsters. After some of the daft stuff past films have shown him doing, it’s surprising and rather thrilling to once again be afraid of Godzilla. 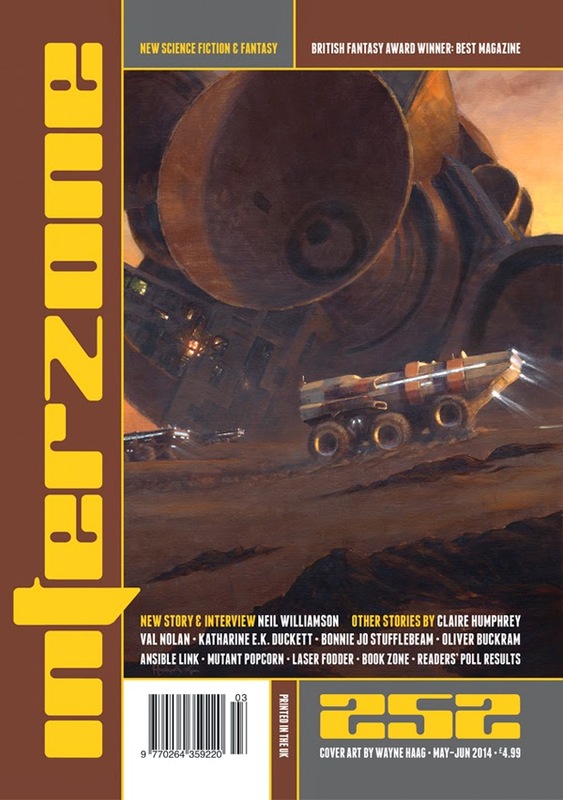 Interzone #252 is out soon, including my review of Nnedi Okorafor's Lagoon. Appearing in Interzone will never stop being exciting, even if it is jolly hard work - I can't quite blather, gush or rant like I do in my more self-indulgent reviews for TQF. Other reviewers in this issue are Nick Lowe, Tony Lee, Andy Hedgecock, Jo L. Walton, Paul F. Cockburn, Paul Kincaid, Duncan Lunan, Simon Marshall-Jones, Matthew S. Dent, Maureen Kincaid Speller, Jack Deighton, Barbara Melville, Lawrence Osborn and Peter Tennant. There are six stories in this issue: The Posset Pot by Neil Williamson, The Mortuaries by Katharine E.K. Duckett, Diving Into The Wreck by Val Nolan, Two Truths And A Lie by Oliver Buckram, A Brief Light by Claire Humphrey, Sleepers by Bonnie Jo Stufflebeam. And those are illustrated by Richard Wagner, Warwick Fraser-Coombe, Wayne Haag and Martin Hanford. There's also the next instalment of Jonathan McCalmont's excellent and provocative Future Interrupted column, David Langford's Ansible Link, and an interview with Neil Williamson about his new novel The Moon King (which is already on my Kindle). More information and subscription details on the TTA Press website. PS. Look out too for Black Static #40. Doesn't feature me this time, but it's from the same publisher and is produced to the same high standard. Theaker’s Quarterly Fiction #47 – out now! 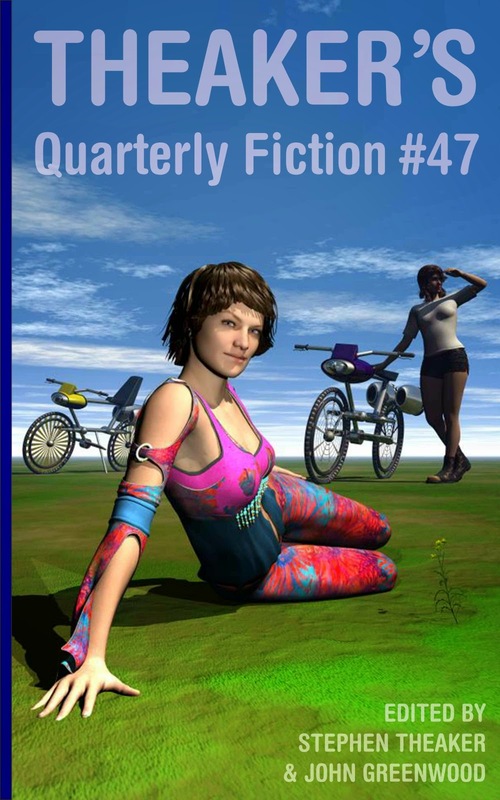 Theaker’s Quarterly Fiction #47. Didn’t think we would get this far, did you? You thought we’d fall for your pathetic little traps. The giant toothpicks in the walls. The pits filled with rabid badgers. The radioactive bananas. So here is Theaker’s Quarterly Fiction #47, unburdened by awards, and bouncing with glee, ready to make you slightly happier than you already are: free epub, free mobi, free pdf, print UK , print USA , Kindle UK store, Kindle US store. It features four stories. “Abandon” by Mitchell Edgeworth takes the Black Swan into spooky territory. Antonella Coriander, who almost definitely exists, and is almost definitely not a pseudonym used to disguise our woeful lack of female contributors, begins her new serial Les Aventures Fantastiques de Beatrice et Veronique with “Bike Ride to Peril”. In Chris Roper’s story “Witchinga” a guy finds out that there are worse things than losing your job, even in the USA. And finally Anthony Malone’s satire “Zombie & Son” does its best to get us into legal trouble with a parody of beloved members of the British establishment which almost certainly does not reflect the real nature of any of the persons concerned. The issue also includes reviews by Stephen Theaker, Douglas J. Ogurek and Jacob Edwards of: Divergent, Doctor Who: The Web of Fear, Elvenquest: The Complete Second Series, The Exploits of Engelbrecht by Maurice Richardson, Ghost Train to New Orleans by Mur Lafferty, The Glorkian Warrior Delivers a Pizza by James Kochalka, Her, The Hobbit: The Desolation of Smaug, I, Frankenstein, Justice League of America, Vol. 1, New Amsterdam by Elizabeth Bear, Paranormal Activity: The Marked Ones, Template by Matthew Hughes, Terra Obscura: S.M.A.S.H. of Two Worlds, The Winds of Gath by E.C. Tubb, and Wonder Woman Unbound by Tim Hanley. Anthony Malone’s fiction has been published in Murky Depths, The Delinquent, Lowestoft Chronicle, The Quotable, Mad Swirl, Litro Online, Bull Magazine and many others and his short stories are included in the anthologies Villainy (Halls Brothers Entertainment), Dieselpunk (Static Movement), Cup of Joe (Wicked East Press) and others. He has read at numerous Live–Lit events and recorded for London Link Radio. He lives in London. Website: www.anthonymalone.co.uk. Antonella Coriander has not previously been published, to her great dismay. Her story in this issue is the first in what we hope will be a new ongoing Oulippean serial. Chris Roper writes, teaches and takes photographs in Vietnam. Douglas J. Ogurek’s work has appeared in the BFS Journal, The Literary Review, Morpheus Tales, Gone Lawn, and several anthologies. He lives in a Chicago suburb with the woman whose husband he is and their five pets. In this issue he reviews Divergent, The Hobbit: The Desolation of Smaug, I, Frankenstein and Paranormal Activity: The Marked Ones. His website: www.douglasjogurek.weebly.com. Howard Watts is a writer, artist and composer living in Seaford who provides the lovely cover art for this issue, illustrating a hypothetical moment of rest from Antonella’s story. His DeviantArt page is here. Jacob Edwards belongs in truth to Australia’s speculative fiction flagship Andromeda Spaceways Inflight Magazine, but we’re happy to be his bit on the side. This writer, poet and recovering lexiphanicist’s website is at: www.jacobedwards.id.au. In this issue he reviews Doctor Who: The Web of Fear and Her. Mitchell Edgeworth has recently left Australia for pastures new. His fiction has been published in Pseudopod and SQ Mag, as well as here. He keeps a blog at www.grubstreethack.wordpress.com and tweets as @mitchedgeworth. “Abandon” is the latest in his Black Swan series to appear in these pages. Like everything we publish, it can be read quite happily in isolation, but if you want to find out how the Black Swan got off the ground and into business, see his stories in #40 (“Homecoming”), #42 (“Drydock”), #43 (“Flight”) and #46 (“Customs”). Stephen Theaker reviews a bunch of interesting things in this issue: Elvenquest: The Complete Second Series, The Exploits of Engelbrecht, Ghost Train to New Orleans, The Glorkian Warrior Delivers a Pizza, Justice League of America, Vol. 1, New Amsterdam, Template, Terra Obscura: S.M.A.S.H. of Two Worlds, The Winds of Gath and Wonder Woman Unbound. He liked some of them very much. For those readers who care about such things, four of those were purchases, four were supplied by the publishers via NetGalley, one was supplied by the publisher via Audible, and one was a birthday present. 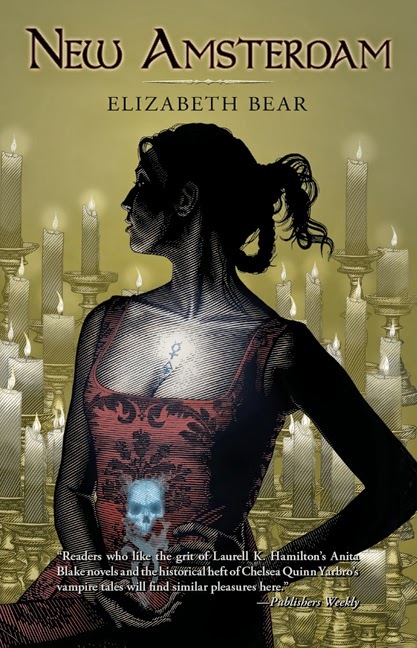 Theaker’s work has also appeared in Black Static, Interzone, Prism and the BFS Journal. Bonus! To celebrate this new issue, all our Amazon exclusive ebooks are absolutely free this week (the offers should kick in over the course of the day): Professor Challenger in Space, Quiet, the Tin Can Brains Are Hunting!, The Fear Man , Howard Phillips in His Nerves Extruded , Howard Phillips and the Doom That Came to Sea Base Delta, Howard Phillips and the Day the Moon Wept Blood , The Mercury Annual and Pilgrims at the White Horizon. All 46 back issues of Theaker's Quarterly Fiction are available for free download. 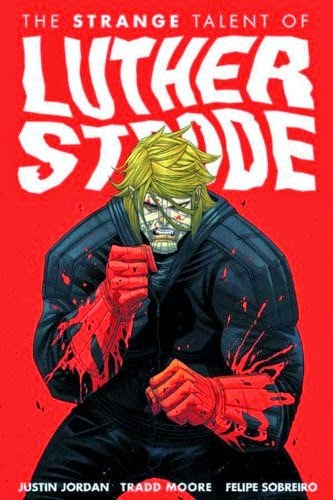 You would be forgiven for thinking that The Strange Talent of Luther Strode (Image, tpb, 162pp) must be related to getting himself published despite the poorness of his book. As well as his megamuscles and talent for ultraviolence, he must be extremely persuasive. Either that or writer Justin Jordan and artist Tradd Moore know where the Image Comics skeletons are kept. As the book begins, Luther has just been shot seven times in the chest, but he’s caught the bullets in his muscles, and works out how to push them back out. He’s also just killed half a dozen guys by kicking and punching them so hard they exploded. And he’s got X-ray vision, which helps when he’s looking for weak spots. Rewind to find out how he got those powers: he was a skinny guy getting bullied, who sent off for The Hercules Method – though it turns out there is a bit more to it than that. He gets into trouble as bad guys come after him, does some fights, gets cosy with a sassy girl, tries to keep his mum and best pal out of trouble. This was one of the worst comic books I’ve read in recent years. There is some fighting, and anger, and violence – lots of blood and rage – and if that’s what you’re after, you might go for it. The story was poor, and the artwork isn’t that appealing, unless you really love seeing what people’s muscles look like under the skin. It grabs bits from Spider-Man – Luther puts his Flash Thompson in a neck brace – and Flex Mentallo, mixes it with Garth Ennis levels of blood, but lacks any of that writer’s wit or imagination. Best avoided. The basic idea of a weed becoming a strongman was handled more imaginatively in Major Bummer (reviewed back in issue #38). In one set of panels a gun is fired at the main villain and he dodges it, which is one thing, but he also, between the bullet being fired and it reaching him, manages to say, “Ah, well then…” – which makes no sense, unless he was talking so quickly the person he was talking to wouldn’t have been able to understand him. Like the book itself, it’s supposed to look cool but falls flat.